DKIM and SPF records are a way of authenticating the emails that you send through Jumplead. By adding these text records to your domain you are telling email servers and clients that the emails you send are really from you. This is very important when it comes to getting your emails delivered to inboxes and not spam folders. 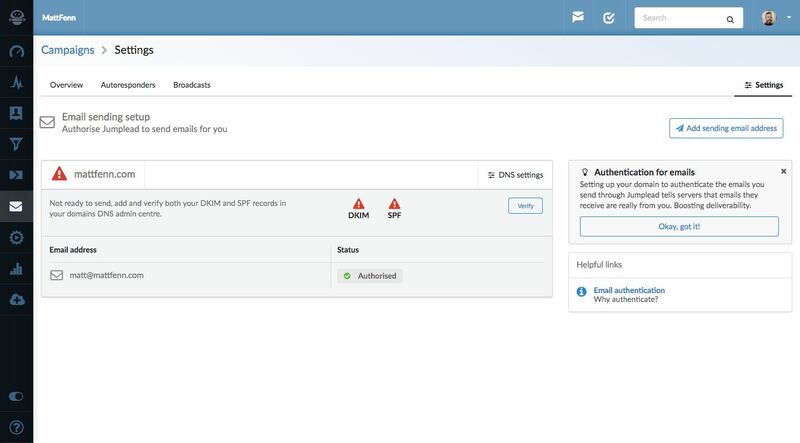 With access to your DNS management service the setup should only take a few minutes. If you don’t have direct access to your DNS management service you might need to liaise with your webmaster. Click on the Settings tab in the Campaigns section of Jumplead to set up your email sending. You will see the domain that you created your Jumplead account with and icons that show whether there are valid DKIM and SPF records published for Jumplead to send on behalf of that domain. 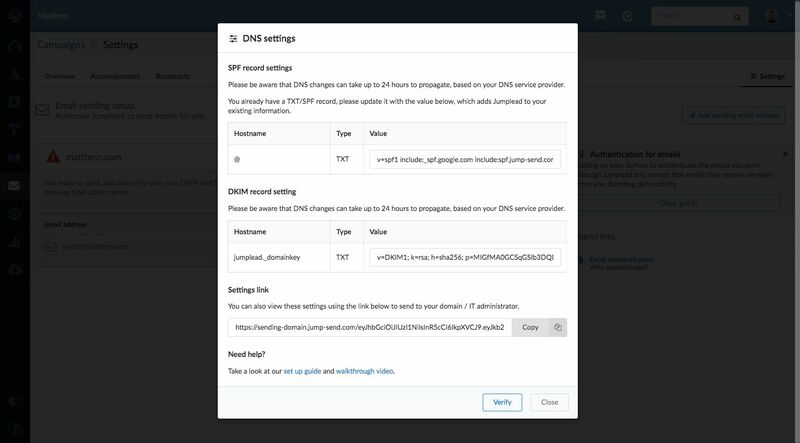 Click on the 'DNS Settings' button on the right hand side of the domain information panel to access the settings you will need to add to your DNS management service. The pop up settings box includes both the SPF and DKIM text records that need to be added to your domain. Once those have been added you can click on the ‘Verify’ link to check that they are configured correctly. Replace your existing SPF record if you have one. We actually include your existing record in the one we supply because you are only allowed one SPF record. All DNS admin systems are different. You might need to include your domain name, the @ symbol or leave it blank. Check with the instructions for your DNS provider. Add a new record, there’s no need to replace an existing record with DKIM. Once your domain is verified (be patient! this can take a while..), you can add the individual email addresses for the verified domains to begin using within Jumplead. To add a sending email address, click the ‘Create Sending email address’ button and add the email address you would like to send from. A code will be sent to that email address which will need to be copied and pasted into Jumplead to authorise the address for email sending. You can create more than one sending domain to use in Jumplead. To add another sending domain click the 'Add sending email address' button in the top right hand side of the page. This needs to be the email address you want your Jumplead emails to come from, it needs to be from your business email domain e.g. me@mybusinessdomain.com. Add the email address you want to use and a new domain control panel will be added where you can access the DNS settings as above. Once that is done, you’re good to go!